Here’s a little trick how to toggle the function keys on Mac OS X with Keyboard Maestro. I’ve set my F1, F2, etc. keys to perform their standard function not the special features printed on each key. I’m used to holding down the function key to toggle the system sound, brightness and so on, but if you’re in the other camp this macro could be interesting for you. UPDATE: I also added a notification center version. This is how the macro works. The first step is to read the current function key state with a shell command action and set it to a variable FN_Key_Status. /usr/local/bin/growlnotify -n FunctionKeys --image /System/Library/PreferencePanes/Keyboard.prefPane/Contents/Resources/Keyboard.icns  -m "OFF: using all F1, F2, etc. 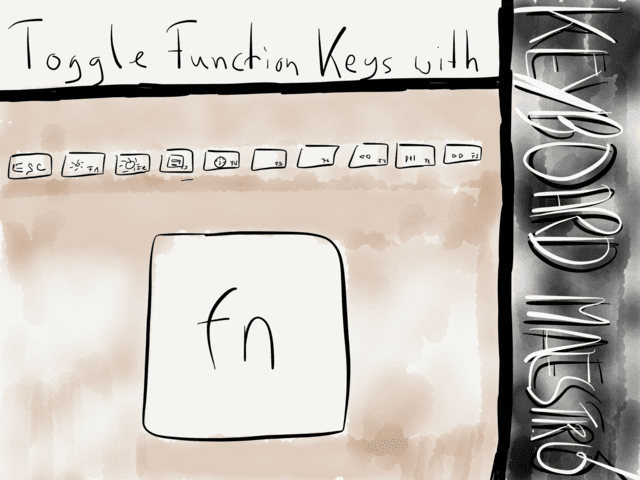 keys as standard function keys!" /usr/local/bin/growlnotify -n FunctionKeys --image /System/Library/PreferencePanes/Keyboard.prefPane/Contents/Resources/Keyboard.icns  -m "ON: using special features printed on the keys!" Then you duplicate the macro and tell it to toggle the keys again if you quit on of the apps. This is only to give you some ideas. 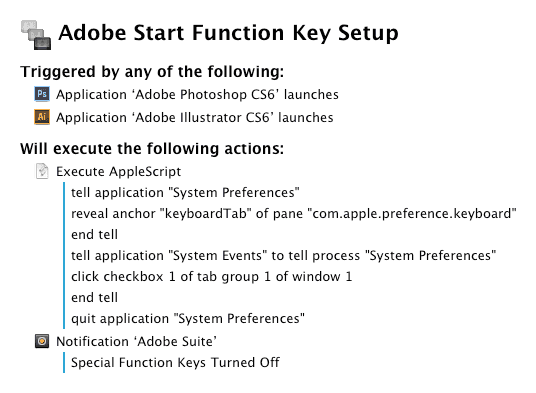 Arguably the better way to do this could be to set a up a If Then Else action in Keyboard Maestro and use to only toggle the function keys if Adobe Photoshop is the front window. If you don’t want to trouble yourself with using Keyboard Maestro there are apps, like Palua or FNable available in the Mac App Store to rid you of the fun that you would otherwise have if you choose to use Keyboard Maestro for automating this. If you prefer using LaunchBar click here. Toggles all functions keys keys: switches between F-Keys (F1, F2, F3, etc.) and Apple's special function keys.